Oklahoma State received a commitment from Igor Ibaka, the younger brother of NBA player Serge Ibaka, last year and he will finally hit the court during the 2015-16 season. 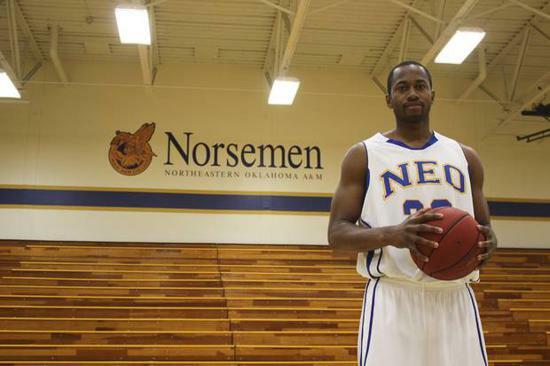 The younger Ibaka, a 6’9 forward, played one season at Northeastern Oklahoma A & M during the 2013-14 season. NJCAA age restrictions on international students, which have now been removed, prevented Igor from playing his second year of JC basketball during he 2014-15 season. He transferred out of NEO A&M and took classes at another junior college during the 2014-15 season to qualify academically. Ibaka will have three years to play at Oklahoma State. Now that Ibaka’s situation is explained many people want to know what they can expect from him on the court. Ibaka is a strong and mobile forward who was impressive during his first year of JC basketball. He has good hands and can score the ball in the low post with his back to the basket. He can shoot a jump hook over his left shoulder and also has the ability to face up in the low and mid post. Ibaka has a frame that is built for the physical post play of high-major D1 basketball. He has solid footwork when facing the basket in the post and uses his size and strength to attack the rim. He also has a good-looking stroke that extends out to about 17 feet and is a good passer out of the high post. He is still developing and there will definitely be an adjustment period after sitting out for a full year, but he should be able to hit his stride by the time conference play comes around. Ibaka also does a very good job of hitting the glass on both ends, and he isn’t afraid to be physical in the pain on the defensive end. Many D1 programs have a hard time finding a low post presence that is willing to do the dirty work, but Ibaka has no problem filling that void. At Northeastern Oklahoma A & M Ibaka averaged 14 points and 9.8 rebounds per game while shooting 64% from the field and 74% from the free throw line. Having a player with Ibaka’s experience, with three years of eligibility, should be a huge asset for Oklahoma State moving forward.